How Good is Your Track Record? Sundeep Bajikar was a sellside Equity Research Analyst covering Technology stocks for nearly a decade. His individual stock recommendations over that period may be available as public information tracked by various third-party information processors. During his sellside career Sundeep served as trusted advisor to a broad range of mutual fund, hedge fund, pension fund, and other types of investment managers in the U.S., U.K., Europe, Japan, Hong Kong, Singapore, South Korea and Malaysia. Over that period Sundeep also served as trusted advisor to a number of senior executives of technology companies within and outside his direct research coverage. 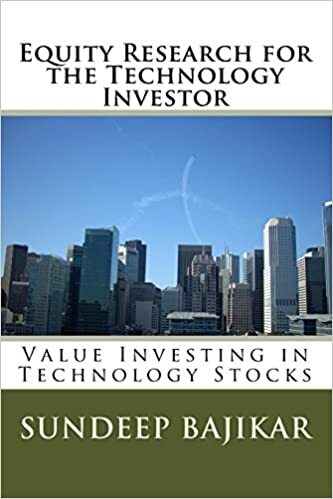 Sundeep’s book titled “Equity Research for the Technology Investor – Value Investing in Technology Stocks” provides a few case studies of recommendations that worked, and others that did not work. The acteve Model Portfolio is based on the equity research process described in Sundeep’s book. Click here for acteve Model Portfolio performance updates. Past performance is not a guarantee or indication of future results.